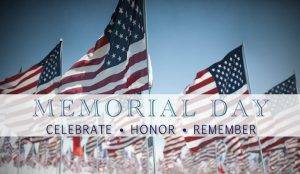 In Observance of Memorial Day, All Office Locations will be CLOSED Monday, May 30th, 2016. Offices on Nicholasville Road/Man O’ War in Lexington and on Main Street in Nicholasville will be OPEN Saturday, May 28th. All locations resume normal business hours Tuesday, May 31st. Please contact Commonwealth Eye Surgery at (859)224-2655 for any ocular emergencies while we are away. Have a safe weekend!